Faced with a surging number of seminarians, the Diocese of Madison in Wisconsin, US, is turning to its parishioners to help fund the training of priests, reports AP in Crux. The diocese has seen its priests-in-training soar from six in 2003 to the current 33. To educate current and future seminarians, the Madison diocese says it needs A$37 million. Church-goers have responded with vigour, the Wisconsin State Journal reported. The campaign began last fall and will continue through the end of this year. Although the campaign has yet to expand to all churches in the 11-county diocese, parishioners already have pledged more than $28 million. “I couldn’t be more pleased,” Madison's Bishop Robert Morlino said in an interview. He gives immense credit to the diocese’s 110 priests who have been rolling out the campaign in their parishes. 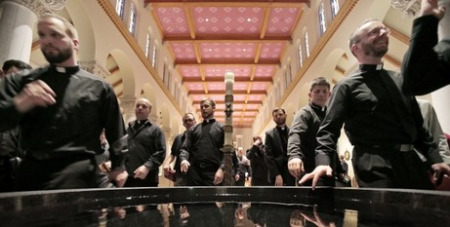 The diocese declined to pinpoint a per-seminarian cost. But calculations, based on interviews and available data, suggest the diocese spends A$3150,000 to $3750,000 to train each new priest — figures diocesan officials did not contest, the newspaper reported. Bishop Morlino has made priestly vocations — the spiritual call to serve — a priority. He increased the position of director of vocations to full-time, and he routinely promotes the priesthood at functions. Photo: Seminarians and faculty left an afternoon prayer service last month, dipping their fingers in holy water and making the sign of the cross, in the chapel of The Saint Paul Seminary School of Divinity in St Paul, Minnesota.